Traders from Clifton Village marched to City Hall in protest of the council’s proposed residents’ parking scheme, which they believe will lead to the “death” of the village. 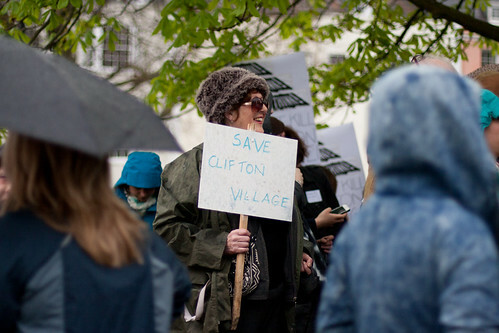 Protestors are worried that the introduction of parking meters and time limits on parking will result in fewer people visiting the village, leading to Clifton losing its character. Alison Bracey from business group BID Clifton Village, who organised the protest, said: “We don’t feel residents’ parking is going to benefit the businesses. Good question @missionverdana It's fear of change. General experience is that residents parking schemes improve place & increase turnover. Proposal maps released by the council show different restrictions on each road, with some roads only catering for residents or traders with permits. The new parking measures will be introduced in Clifton Village on Thursday 1 May. A review of the scheme will take place six months after it is launched, which will give the council the opportunity to change the scheme to make sure it still meets the needs of the community. It is clear that traders in Clifton Village are unhappy about the introduction of a residents’ parking scheme, but it remains to be seen whether the changes will actually impact the area negatively. Objections to the proposals can be made in writing or sent to the council via email until Friday 11 April. Please quote reference CAE/NMT/P/888 and include your name and address.